So there’s a pretty cool new start-up car rental company who just made it’s way to Denver called Car2Go. Bit different concept than others like Zipcar where you have to pick up and park your car in specific designated spots, Car2Go allows you to drop off their cars at any city parking meter. You use their GPS app to find a car parked near you, reserve it, drive off, park it again at a meter and walk away. Easy. And far more convenient than having to find a designated agency lot, which could be full. Leaving you having to drive around to find another free spot to park. I knew the company was now in Denver but I hadn’t signed up yet. The other day though I was walking down the 16th street pedestrian mall when I saw a Car2Go booth setup with a couple young people giving away t-shirts and signing people up (note to Car2Go, you need to have XL shirts to give away. Only L and M is kinda lame). So I wasn’t going to stop then and spend the time signing up (was on my way to a meeting). But I took one of the flyers they were handing out when they told me if I registered with a special code in the next 2 days, my annual $35 membership fee would be waived for life. Good deal. So as I’m walking away and reading the flyer I noticed something wrong right away. Notice a problem anywhere? Look at the URL they want you to go to to sign-up. 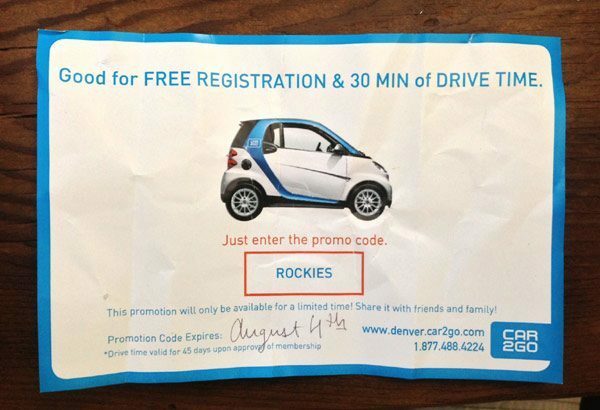 www.denver.car2go.com isn’t a valid web address. You can’t use WWW in front of a subdomain. Browsers won’t resolve that (well they normally won’t. You can go into the domain’s DNS and make a specific entry for this situation, but no site administrators ever do that normally and clearly Car2Go didn’t in this case). So all the people who came by the Car2Go booth that day and walked away with the flyer, excited to go home and signup, went to their computers, typed in that URL and landed on a broken page. Fail. Obviously a terrible user experience and odds are very few regular people would know that using a WWW before a subdomain in an URL won’t work. If you remove the www from the URL page loads just fine. But instead they will just think the site is broken, not up, or whatever and move on. A registration lost for Car2Go. Amazing that no one at Car2Go bothered to test the link after the flyers went to print. This is why having a web savvy editor is invaluable. They catch things like this.